Crickets have long been considered to bring good fortune, although torturing one until your luck changes has never really worked. The song of the cricket is a symbol of leisure and happiness and also a good indicator that you left a window open. The Chinese felt this way as did many Native Americans. 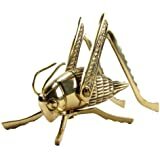 In China, crickets were kept in little cages to keep them from running away and giving good luck to the guy down the block. American Indians, on the other hand, would set the crickets up in little apartments and pay their utility bills under an assumed name. Note that historically, neither the Chinese nor the American Indians have had a lot of what you might call “luck”, but I think it is unfair to put all the blame on the crickets. Well, anyone who likes Dickens can’t be all bad. My favorite is The Pickwick Papers. That little essay was written in response to an ad asking for a humorous take on hearth crickets. I finished the essay but never submitted.